"Albemarle County" redirects here. For the North Carolina county abolished in 1739, see Albemarle County, North Carolina. Albemarle County is a county located in the Piedmont region of the Commonwealth of Virginia. Its county seat is Charlottesville, which is an independent city and enclave entirely surrounded by the county. Albemarle County is part of the Charlottesville Metropolitan Statistical Area. As of the 2010 census, the population of Albemarle County was 98,970, more than triple the 1960 census count. Albemarle County was created in 1744 from the western portion of Goochland County, though portions of Albemarle were later carved out to create other counties. Albemarle County was named in honor of Willem Anne van Keppel, 2nd Earl of Albemarle. 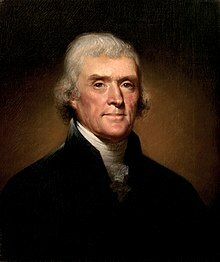 However, its most famous inhabitant was Thomas Jefferson, who built his estate home, Monticello, in the county. At the time of European encounter, the inhabitants of the area that became Albemarle County were a Siouan-speaking tribe called the Saponi. In 1744, the Virginia General Assembly created Albemarle County from the western portion of Goochland County. The county was named in honor of Willem Anne van Keppel, 2nd Earl of Albemarle and titular Governor of Virginia at the time. The large county was partitioned in 1761, forming Buckingham and Amherst counties, at which time the county seat was moved from the formerly central Scottsville to a piece of newly central land, christened Charlottesville. In 1777, Albemarle County was divided and Fluvanna County established, finalizing the boundaries of modern Albemarle County. 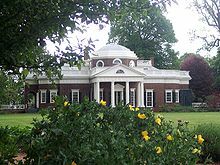 Albemarle County is well known for its association with President and Founding Father Thomas Jefferson, who was born in the County at Shadwell, though it was then part of Goochland County. However, his home of Monticello is located in the County. During the Civil War, the Battle of Rio Hill was a skirmish in which Union cavalry raided a Confederate camp in Albemarle County, Virginia. Until the Civil War, the majority of Albemarle County's population consisted of enslaved African Americans. According to the U.S. Census Bureau, the county has a total area of 726 square miles (1,880 km2), of which 721 square miles (1,870 km2) is land and 5 square miles (13 km2) (0.7%) is water. The Rivanna River's south fork forms in Albemarle County and was historically important for transportation. The south fork flows in-between Darden Towe Park and Pen Park. Boat ramp access is available at Darden Towe Park. The James River acts as a natural border between Albemarle and Buckingham Counties. Albemarle's western border with Augusta and Rockingham Counties is located within the Shenandoah National Park. Albemarle County borders 8 other counties, more than any other county in Virginia. The largest self-reported ancestry groups in Albemarle County are English 16.3%, German 16.0%, Irish 12.7%, "American" 11.4% and Italian 5.2%. As of the census of 2010, there were 98,970 people, 38,157 households, and 24,578 families residing in the county. The population density was 137 people per square mile (52.8/km²). There were 42,122 housing units at an average density of 58 per square mile (22.4/km²). The racial makeup of the county was 80.6% White, 9.7% Black or African American, 0.3% Native American, 4.7% Asian, 0.1% Pacific Islander, 2.3% from other races, and 2.4% from two or more races. 5.5% of the population were Hispanic or Latino of any race. There were 38,157 households out of which 28.2% had children under the age of 18 living with them, 51.4% were married couples living together, 9.6% had a female householder with no husband present, and 35.6% were non-families. 28.0% of all households were made up of individuals and 25.9% had someone living alone who was 65 years of age or older. The average household size was 2.41 and the average family size was 2.96. In the county, the population was spread out with 21.5% under the age of 18, 12.3% from 18 to 24, 24.7% from 25 to 44, 27.2% from 45 to 64, and 14.3% who were 65 years of age or older. The median age was 38.2 years. For every 100 females there were 92.69 males. For every 100 females age 18 and over, there were 89.59 males. 22% of Albemarle residents have a graduate or professional degree, compared with 10% nationwide. The median income for a household in the county was $63,001, and the median income for a family was $98,934. Males had a median income of $55,530 versus $52,211 for females. The per capita income for the county was $36,718. About 3.8% of families and 10.4% of the population were below the poverty line, including 8.0% of those under age 18 and 2.4% of those age 65 or over. 35% of people working in Albemarle live in the county, while 65% commute in. 19% of those commuting in live in Charlottesville, while the remainder live in the surrounding counties. 26,800 people commute out of Albemarle for work. 48% of those commute to Charlottesville, making up 51% of Charlottesville's in-commuters. In 2016, Albemarle has a 3.5% unemployment rate, compare with a national rate of 4.9%. 36% of workers in Albemarle are employed by the government, with 898 working for the federal government, 12,476 working for the state government, and 4,127 working for the local government. Albemarle is governed by an elected six-member Board of Supervisors. Management of the County is vested in a Board-appointed County Executive. Albemarle is represented by Republican Bryce Reeves and Democrat Creigh Deeds in the Virginia State Senate, Republican Steve Landes Democrat David Toscano, Republican Rob Bell, and Republican Matt Fariss in the Virginia House of Delegates, and Republican Tom Garrett Jr. in the U.S. House of Representatives. Earlysville Volunteer Fire Company Engine 45 at the Independence Day Parade. Crozet Volunteer Fire Department Engine 52 truck during the same parade. Albemarle County has two branches of law enforcement, the Albemarle County Police Department, which handles criminal matters and is directed by the appointed police chief, Colonel Steve Sellers. The second branch is the Albemarle County Sheriff's Office, which handles civil service in the county and they are directed by the elected Sheriff Chip Harding. EMS services are provided by three volunteer rescue squads and Albemarle County Fire Rescue. The Charlottesville-Albemarle Rescue Squad, located in the City of Charlottesville, providing 24hr EMS services to the City of Charlottesville and on nights and weekends in particular areas of the county, the Western Albemarle Rescue Squad, located in Crozet, and the Scottsville Volunteer Rescue Squad, located in the town of Scottsville. Albemarle County Fire Rescue operates 6 Advance Life Support ambulances, Medic 4 (Earlysville), Medic 8 (Seminole), Medic 11 (Monticello), Medic 12 (Hollymead), Medic 15 (Ivy), and Medic 16 (Pantops). Albemarle County Fire/Rescue system is a combination system that consists of seven volunteer fire stations and three career fire stations(Hollymead, Ivy and Monticello). Three of the volunteer stations (stations 3, 5, and 7) are covered 24 hours a day by volunteers. The other volunteer stations (2, 4, 6, and 8) are supplemented by career staff Monday - Friday, 6AM - 6PM. Volunteers operate these stations weeknights from 6PM - 6AM as well as weekends and holidays. The three career stations are staffed 24 hours by both career and volunteer firefighters Volunteer and career firefighters are trained and work together to provide Fire and EMS services to the population of Albemarle County. Albemarle County Fire Rescue has begun building a station (Station 16) in the eastern portion of the county near Pantops area slated to open in Fall of 2018. The Albemarle County Public School System operates public education in the County. It provides education to nearly 14,000 students including preschool through high school. The Albemarle County Public School System's mission is to "establish a community of learners and learning, through relationships, relevance and rigor, one student at a time." ACPS provides 25 school facilities which include Murray High School, a charter school, that is located in the City of Charlottesville. , Albemarle High School, Western Albemarle High School, and Monticello High School. The School Board and the Superintendent, Dr. Pamela Moran, work closely together in operating the Albemarle County Public School System. Some students attend several private schools in the City of Charlottesville. Jefferson-Madison Regional Library is the regional library system that provides services to the citizens of Albemarle. The city of Charlottesville is enclaved within Albemarle County. Under Virginia law in effect since 1871, all municipalities in the state incorporated as cities are legally and politically independent of any county. Many of these unincorporated areas have Charlottesville addresses. United States President and Governor of Virginia Thomas Jefferson's home, Monticello, is located in Albemarle County. United States President and Governor of Virginia James Monroe's home, Ash Lawn-Highland, is located in Albemarle County. James Walker Gons (1812–1870), born in Albemarle County, Baptist church clergyman, later converting to Christian Church (Disciples of Christ), editor and publisher of church's Christian Intelligencer, educator. Lottie Moon (1840–1912), Southern Baptist missionary to China; Southern Baptists worldwide take up a Christmas Offering every year for International missions in her name. ^ "County Overview". County of Albemarle. Archived from the original on 19 December 2008. Retrieved 2008-11-14. ^ Pawlett, Nathaniel (1976). "An Index to Roads Shown in the Albemarle County Surveyors Books 1744-1853" (PDF). Charlottesville, Virginia: Virginia Highway & Transportation Research Council. Archived (PDF) from the original on 30 October 2008. Retrieved 2008-10-11. ^ a b Atkins, Ace (2007-03-27). "A county by any other name?". C-Ville Weekly. Portico Publications. Archived from the original on 2011-07-08. Retrieved 2008-10-11. ^ "Enslaved Population in Virginia". www.encyclopediavirginia.org. Retrieved 2018-08-20. ^ "County Executive". County of Albemarle, VA. Retrieved June 21, 2015. ^ "Board of Supervisors Home". www.albemarle.org. Retrieved 2018-08-17. ^ "Circuit Court Clerk's Office". www.albemarle.org. Retrieved 2018-08-17. ^ "Meet the Board Members". www2.k12albemarle.org. Retrieved 2018-08-17. ^ a b "System & Stations". www.albemarle.org. Retrieved 2018-08-17. ^ a b "Division Fact Sheet". www2.k12albemarle.org. Retrieved 2017-11-07. ^ "Our Schools". www2.k12albemarle.org. Retrieved 2017-11-07. ^ National Register of Historic Places Inventory Nomination Form: Mirador (Boundary Increase) (Report). Commonwealth of Virginia, Department of Historic Resources. 7 April 2003. ^ "Inside The New York Times Book Review: John Grisham on 'The Whistler'". The New York Times. 2016-11-04. ISSN 0362-4331. Retrieved 2017-11-07. ^ Healy, Patrick. "Grisham's 'Time to Kill' Coming to Broadway". ArtsBeat. Retrieved 2017-11-07. Richey, Homer, ed. (1920). Memorial History of the John Bowie Strange Camp, United Confederate Veterans: Including Some Account of Others Who Served in the Confederate Armies from Albemarle County, Together With Brief Sketches of the Albemarle Chapter of the United Daughters of the Confederacy and the R. T. W. Duke Camp, Sons of Confederate Veterans. Charlottesville, Va.: The Michie Co. Retrieved May 22, 2015. Wikimedia Commons has media related to Albemarle County, Virginia.